November 25 Amazon is now offering Fallout 76 for $34.99. That’s 42% off its initial price, just 11 days after it came out. 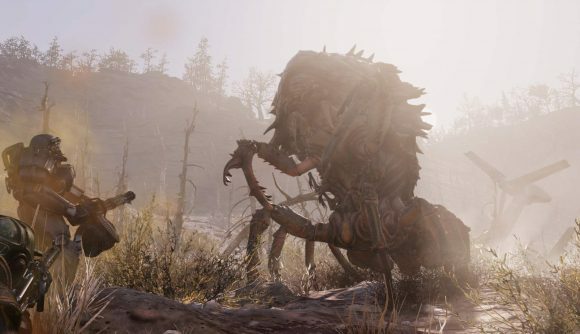 Fallout 76 is already available at a steep discount, if you’re itching to play Bethesda’s latest iteration of the post-apocalypse. The publisher is offering its latest game for 33% off, and many retailers are, too. Fallout 76 is currently available for around $40 USD, if you’re willing to round off a couple pennies. The official Bethesda store has it on sale for $40.19, and other online retailers are offering the same discount. Humble, for example, is offering Fallout 76 for the same 33% discount, but the store had run out of keys. You can still buy the game from Humble at the marked-down price, but you’ll have to wait until the store gets more keys – which Humble says are on the way. If you’d like to save a couple dimes on what is arguably the year’s most disappointing game, Best Buy has Fallout 76 available for a smooth $39.99 on Windows PCs. Now, Amazon is offering Fallout 76 at an even steeper discount. You can get the game at the online retailer for just $34.99. Thirty-three percent off just ten days post-launch isn’t a great sign for Fallout 76, which by all accounts is a lonely, frustrating experience. Of course, you can read our Fallout 76 review if you want to learn more, or check out our roundup of the critics’ takes on it. Safe to say that Bethesda’s online experiment with the Fallout franchise hasn’t gone particularly well, but at least now you don’t have to pay full price to see for yourself.